Why do Young Readers Turn to Fantasy? 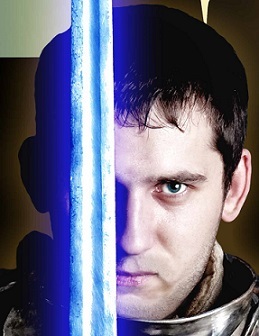 The fantasy genre has exploded in popularity over the past twenty years. From the big screen adaptations of The Lord of the Rings, Harry Potter and The Chronicles of Narnia, to endless new novels often directed to teens and young adults. Fantasy has always appealed to younger readers as escapism, but is this the only reason, or is there something more for the current generation? …expected to do little more than have a good time and do their homework, [now they] long for significance. They want to do something that matters, that has eternal purpose…long for a life that matters, and they find in fantasy a world that needs someone who will step up and do just that. Then too, fantasy helps young people organize the world. There is moral right and wrong, and the characters in fantasy must align themselves with one or the other. There’s also history that makes a difference in the here and now, prophesy that tells about the future, and decisions that make or break a destiny. So I suspect that these, and the other reasons that LuElla details, are not all that different for all age groups. Finding your true purpose, your place in the Story, is the desire that burns in all people. Younger readers just haven’t given up on that quest. They haven’t allowed societal forces to tell them where to go or what to do. Yes, one could also argue that flawed materialistic and relativistic beliefs have replaced solid and logical worldviews. Perhaps a good dose of fantasy is, ironically, needed to show us reality. J.C.L. Faltot, author of the The Road to Mars, interviewed me for the latest episode of his The Writer’s Lens podcast. Check it out here as we discuss writing, fantasy and the war Among the Shadows. What is the name of the Princess of Mars? What planet did Carson Napier travel to? Use the Contact form to send the answers, and I’ll send the first person who answers all three correctly a copy of my book for your Kindle (Hint: All the answers can be found on this website). 1. Dejah Thoris is the Princess of Mars, from Edgar Rice Burroughs’ Barsoom tales. 2. Thongor is from Valkarth (or I would have accepted Lemuria) from Lin Carter’s Thongor of Lemuria fantasy series. 3. While John Carter was on Mars, Carson Napier was on Venus in Edgar Rice Burroughs’ Carson of Venus adventures. Congrats to our winner, and watch for more contests coming soon! Always on the lookout for a new fantasy series, I ran across Dragonlance a few weeks ago. It turns out the series isn’t new, but began way back in 1984 with Dragons of Autumn Twilight. This would spawn nearly 200 books in a shared universe. In the book world, a “shared universe” is a series of books written by multiple authors. Dragonlance is set in the mythical land of Krynn. Like many “classic” fantasy tales, it is populated with races of humans and other creatures, battles between good and evil, and those who must rise up and decide the fate of the world. I know there are some who look down upon such stories as a “trope” — and I’m sure whatever they are reading is high-level, amazing literature — but the rise of heroes to battle evil is a timeless theme that crosses genres and speaks to our own existence. For four decades now, Terry Brooks has penned his epic Shannara fantasy series. Now, he has decided to bring it to a close. Recently announced, he will write the chronicological end of his creation in a series of books. Then he may — or may not — go back and write some books to fill in gaps in the series. With nearly 30 books in the series thus far, Shannara has become a staple world in the fantasy genre. It emerged at a time when high fantasy fans didn’t have much to choose from. When I had read everything Tolkien had written (which, unfortunately, wasn’t a lot), a friend recommenced Terry Brooks. While some argued his first book, The Sword of Shannara was too much like LotR, the series quickly established itself as an original world. So for Tolkien fans, Brooks provided a land of humans, elves and other creatures that filled the post-Tolkien void. As a series goes, some of the books are self-contained standalones, though most are trilogies. This makes it easy for new fans to drop into Shannara without necessarily going back to the first book. The books, or groups of books, usually are separated by decades, if not centuries of time. One issue fans of the epic Wheel of Time series have, is that if you started it as a kid, you didn’t finish it until you had kids. Plus, you can’t start at, say, volume 12. On the other hand, I’m sure many Shannara fans have hoped for Brooks to go back and revisit their favorite characters. I recommend starting with the first book, but regardless where you begin, Shannara is a land that will endure for ages to come. No class or book on writing ever skips the quintessential topic of beginnings. Few other things do writers lose as much sleep over. There are endless lists on how to start a story and how not to start a story. Yet, as with everything, this process becomes easier the more it is put into practice. In Among the Shadows, the Prologue was rewritten three times — with the first two being recycled back into the book elsewhere. With Book 2, Awakening, the Prologue has come together much quicker and appears more set in stone. Of course, this doesn’t mean it won’t change as the book progresses. In any case, I will share it here, to give a taste of what is to come. This isn’t a final draft and more refinement of detail, pace and tone is in order. This is also a good exercise in finding the right balance in detail. This Prologue is, to a large extent, pulled from history (some of the queen’s words verbatim). Enough detail to paint a picture in the reader’s mind of the scene and time, but not so much that it sounds like a history lesson. Sure, an Egyptologist might want more or quibble with changes, but most readers want a living scene in their mind. Among the Shadows for Kindle now on sale for $2.99! Among the Shadows is heading out on the show circuit, so I thought I’d throw a little special out there…plus a teaser for Volume 2 is coming soon. Then he finds himself on another world, in one peril after another. And nearly always, he encounters a woman that was meant for him and he must fight for her by conquering unimaginable dangers. This is the classic foundation of the stories perfected by Edgar Rice Burroughs in lost worlds, hidden jungles and on faraway planets. He managed to keep each creation fresh and exciting, as did Otis Adelbert Kline who followed in his footsteps. Another is the underrated Lin Carter, who’s creation of Thongor we have already reviewed. 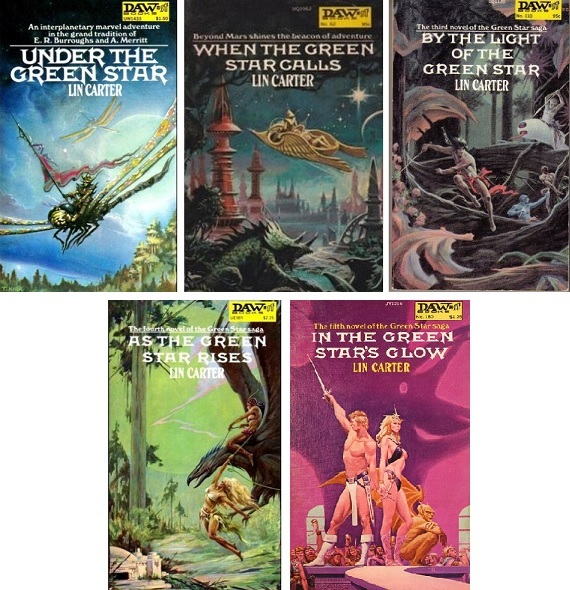 Now, travel to a distant world in the Green Star series. Here a crippled man finds a way to send his soul to a faraway world. There he enters the dead Chong the Mighty, and later Karn the Hunter, taking his place in this tropical world where the races live in towering forests. Soon he encounters Niamh the Fair, a princess, who he quickly falls in love with. However, and this is no surprise, before he can forever be her mate, five books full of death-at-every-turn adventure must be overcome. Why have such stories, so often derisively called “pulp,” endured for decades? They all have the underlying theme of being fed-up with conformity, the status quo and what society has decided life should be like. Sure, they are often told from the perspectives of men, but the women they meet are not fragile flowers. Read to be entertained. Read to get lost. Read to be inspired. Since I could walk, I have moved among the tress of the timeless forests of the Riverlands. 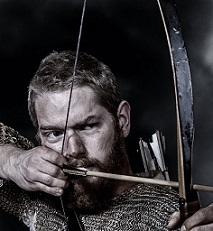 Unseen and unnoticed, the arrows of my bow cut through the morning mists, their targets never missed. In my travels I see what once was. Places and people that have passed from memory. Timeslips. Thin places in the veil. These I can see, but that is not all. I can see past time. To you it may seem as it has slowed, to me, I am unbound by its confines. The abominations in the shadows do not know me, but they will soon learn to fear me. I am Conrad Wojtek, a hunter of what lies in the Darkness.